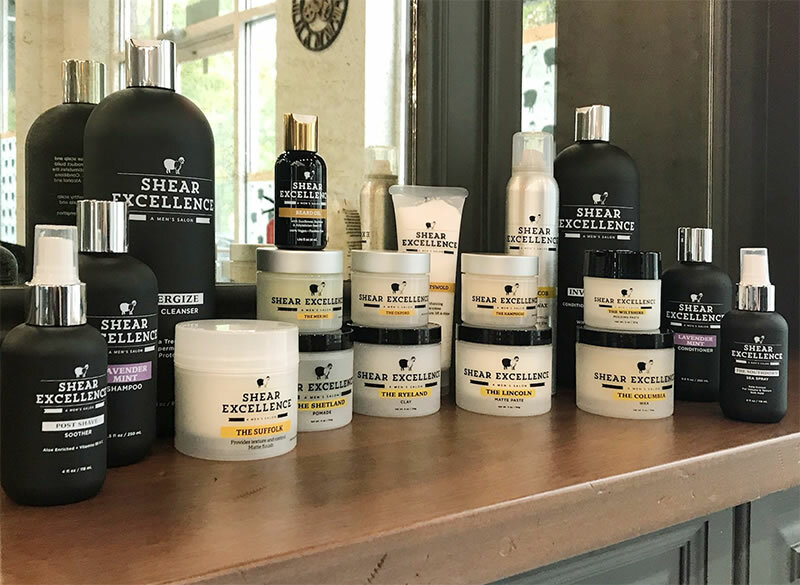 We now carry our own exclusive line of Shear Excellence products! We wanted to find products that were different than the generic brands you can find anywhere, so we set out on a mission to find the very best products for men. Our line consists of a wide range of styling products, sprays, beard oil, shave products, and the best shampoo and conditioner out there! Be sure to try our invigorate: 2 in 1 conditioner and shave lotion with a peppermint finish to leave you feeling cool and refreshed! Creates superior, advanced skin care for men including shaving creams, moisturizers, grooming sets, cleansers, anti-aging, hair care, body care and sun care products specially formulated for a man's needs. Nothing complicated, nothing cosmetic, just real solutions that provide immediate visible results. Tea tree shampoo is used to treat scalp conditions such as dandruff and to stimulate new hair growth by clearing out old dead skin cells from hair follicles. It has been said that due to the tingly feeling and fresh, minty smell, tea tree shampoo makes a person feel invigorated and energized. For a good shampoo that cleans hair thoroughly and leaves it shiny, tea tree shampoos are often recommended by salons. Tea tree shampoo is also good for controlling head lice. Tea tree shampoo uses vary. If you have scalp conditions such as dandruff or head lice, tea tree shampoo may benefit you. If you are trying to stimulate hair growth and want to feel refreshed after shampooing, tea tree shampoo might be just the right product for you. NIOXIN Bionutrient Formulations help to address the combination of factors linked to noticeably thin-looking hair and creates an optimum scalp environment by removing excess sebum containing elevated levels of DHT from the hair and scalp. How do I know which products to buy? (1) Do I have normal hair density to early stages of thin-looking hair or do I have advanced stages of thin-looking hair? Starter kit for normal hair density early stages of thin-looking hair or Advanced Starter Kit for advanced stages of thin-looking hair. (2) Do I have chemically or non-chemically enhanced scalp and hair? ionutrient Protective system for chemically enhanced or Bionutrient Actives system for non-chemically enhanced scalp and hair. What are the side effects of using NIOXIN products? Nioxin uses naturally derived ingredients which have no known side effects. Can I still use other products with NIOXIN? To create a healthy scalp environment, and achieve the best results, we recommend only use the NIOXIN system. However, the Bionutrient Protective or Bionutrient Actives Systems of products works within your normal hair care routine. Are NIOXIN products only recommended for find and thin-looking hair? The Bionutrient Formulations of products are for anyone of any age, desiring a complete hair care system, designed to help restore an optimal hair and scalp environment. How long do I need to use NIOXIN? The Bionutrient Formulations systems are of benefit as long as use is continued. Discontinued use, discontinued benefits.